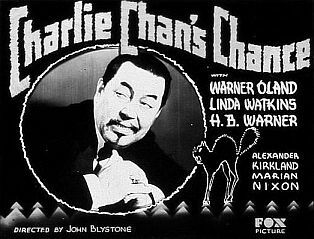 Many fans of Charlie Chan are doubtless aware of the fact that four of the earliest films from the series are currently classified as "lost" with no known prints being available for viewing. 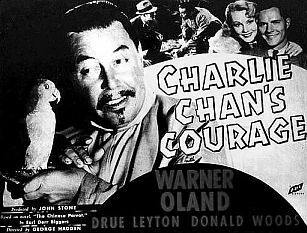 These films, Charlie Chan Carries On (1931), Charlie Chan's Chance (1932), Charlie Chan's Greatest Case (1933), and Charlie Chan's Courage (1934) are, however, to our great good fortune, still available in script form. During the year 2000, four available scripts for the missing films were accessed and transcribed, an endeavor that required a dozen trips to Los Angeles. The result was the collection of four "lost" Charlie Chan film scripts which were humbly offered to visitors to this site for a decade. These included a "Final Shooting Script," dated December 23, 1930, for Charlie Chan Carries On, a "Screen Continuity" for Charlie Chan's Chance, carrying the date January 9, 1932, a "Revised Final Shooting Script" for Charlie Chan's Greatest Case, from July 7, 1933, and a "Final Shooting Script" for Charlie Chan’s Courage bearing the date March 19, 1934. In 2010, good fortune smiled again. Scripts for all four "lost" films containing the actual finished dialogue "taken from the screen" became available. It was immediately evident that our four "original" production scripts were now woefully inadequate, as the finished dialogue from the actual pictures differed, sometimes greatly, from that contained in the scripts that we presented here, at our Charlie Chan Family Home. Also, these "dialogue" scripts, while containing complete sequences of all lines spoken by the actors in the finished films, contain only the most meager of directive or descriptive text. This presented a dilemma: How to best present the new material in a way that would most accurately – and most enjoyably – convey the best possible representations of how the four "lost" Charlie Chan movies appeared –and sounded - to audiences who viewed them many decades ago. That was our goal, often as illusive that robin's egg in winter. The result, after painstaking and sometimes frustrating effort, is a collection of four "composite" scripts. Each "composite" script was created by overlaying the text of the "dialogue" script upon the existing text and directions as found in the previous production scripts. Sometimes, everything fell into place very neatly, as the two examples meshed almost exactly. However, the opposite was at times the case. In such events, "educated guesses" were used. In a rare instance or two, is was obvious that an important line was missing from the "dialogue" script, and this made it necessary to replace that gap with a line from the production script. Each of these scripts has been illustrated whenever possible with existing images that have been inserted, as accurately as possible, into the text in their appropriate spots. Most of these images have come to us through publicity stills, as well as images made from stills. 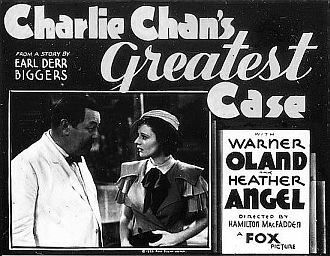 In the case of Charlie Chan Carries On, a goodly amount of visual material consisting of video captures from the Spanish language version of this film, Eran Trece, has been used. Much of this material was, in all probability, stock footage which would have also appeared in the "lost" English language version starring Warner Oland. Also used in a few instances are other captures from Eran Trece, which, although uniquely from that film, are vague enough, and are probably very similar visually to what appeared in Charlie Chan Carries On, to faithfully illustrate some of the moments in the latter movie. 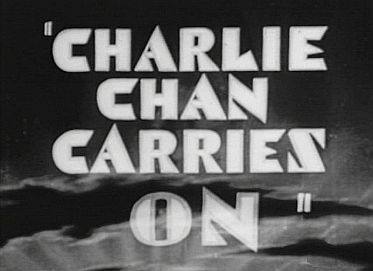 A wealth of imagery was also culled from the original trailer for Charlie Chan Carries On which, through great good fortune, exists today. Fortune still smiling, existing video out-takes from Charlie Chan's Greatest Case were also accessed for illustrative material for that film's script. Several other stock images, such as the well-known Chan family group photograph, were also used to enhance the scripts. The text of each script has been reformatted for easier reading. Obvious typographical errors have been corrected. Other slight changes were made for reasons of consistancy and clarity to words such as "O.K." which was rendered as "okay." If necessary, any additional information that has been placed within the text for purposes of clarity is enclosed in [brackets]. Only when necessary was any wording from the original scripts been altered, mainly due to changes brought about by added dialogue and the need for clarity. In such cases, the changes were never in the area of dialogue, but, rather in the cutting and rearranging of directional text. In all cases and in every "composite" script, the reader can be assured that the dialogue is complete and in the correct order. As visitors read through our collection of illustrated "composite" scripts, they will still be able to access the original, illustrated production scripts that have been the cornerstone of our humble museum since its opening in 2001. It is hoped that each finished product gives you, our honored guest, a very accurate representation and "feel" of what each of the four "lost" Charlie Chan films was like for fans of the detective who enjoyed his adventures on the silver screen generations ago.